"Have you ever left an event and made a pit stop for an errand on the way home only to discover you still have your event name badge on a lanyard around your neck?" Are you an ABBA fan? I sure am. 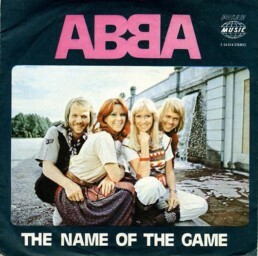 ‘The Name of the Game’ was the first single they released on their fifth album and it was a UK #1 for four weeks. ABBA nailed this one, but not every track becomes a hit. Just like song writing, event planning is a complex and multi-layered undertaking. Events involve a huge amount of planning and close attention to detail. I’m not sure ABBA had event planning in mind when they titled this popular song in 1977, however, just like song writing, sometimes when it comes to name badges, event professionals miss the mark. Printing out event name tags are usually the last thing on the to-do list, but that doesn’t mean it is any less important. Your event attendees, after all, will wear them for the whole event, will use them as a means to meet one another and may even take them home as mementos. Have you ever left an event and made a pit stop for an errand on the way home only to discover you still have your event name badge on a lanyard around your neck? Yup, me too. So, wouldn’t you love it if that name badge was actually a fashion accessory?! Don’t worry, I’ve got you covered because at iSPARK we’re all about looking good. Tip #1 - The badge design should match the branding of your event. Use your event and company logos and corporate colours. Tip #2 - The person’s name needs to be written in large print. As a woman, there is nothing more awkward than having someone squinting at your chest… to read your nametag, of course. In that same vein, you should also make sure the lanyard is adjustable, since placement is different for everyone. Tip #3 - Add the person’s organization or company name and her/her social media to the badge. This instantly creates another way to network and interact online during and post-event. Tip #4 – Don’t be afraid of colour! At iSPARK, we love orange and we use it whenever we can. So, tap into the colour printer. You can even colour code badges to identify different categories of registration or different access levels or types of accreditation. Tip #5 – Have you noticed that name badges have two sides? Make use of that extra real estate – for event sponsors or as a double-sided piece (i.e. if your lanyard spins around, you’ve printed the badge information front and back). Smart, right? No-No’sI’d also like to point out some major deal breakers when it comes to name badge or accreditation design: - Don’t use badges that will damage clothing (like leaving pin holes or sticker residue). - Make sure you have means to print a quality badge onsite during the event. It’s just so awkward when you see event attendees walking around with a hand-written or makeshift name badge that looks like a grade 4 art project. 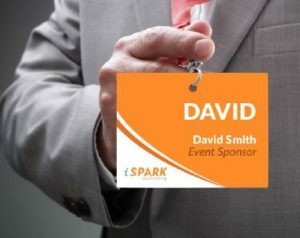 Get the full scoop on name badges that top the charts (and more) in Volume I of my Event Planning Survival Guide, a free download here.